Building the best forex trading system requires that we learn some techniques or strategies from world class traders whom have tested and tried different trading methods in live market conditions over a long period of time. One of those traders is WD Gann. He spent a life time experimenting, trading and teaching people the art of trading or speculating as he calls it. WD Gann charged a fortune for some of his trading courses. (Equivalent to the cost of a house). He also wrote many books which included hidden gems scattered throughout. He also made no secret about not disclosing some of his more powerful techniques. He stated that some techniques were too powerful to be released into the public domain. Read more about William Gann here. What Gann trading enthusiasts have figured out is that one of his favorite day trading strategies involved his use of natural square numbers. read more here. It is also clear from his writing that "time" played one of the most important roles in his trading. He also advised traders or speculators to look for price patterns like double or triple bottoms or tops, higher bottoms or lower tops. From this information we can create the best forex trading system. We will now take a look at putting some of these elements together. Take a look at the chart below and notice how we can construct a day trading system based on some of WD Gann's techniques. The above chart is the 3 hour AUD/USD. Any time frame can be used with adjustments to the natural square levels. Shorter time frames require the dividing of the natural square levels by 50% to a more appropriate level. 1. 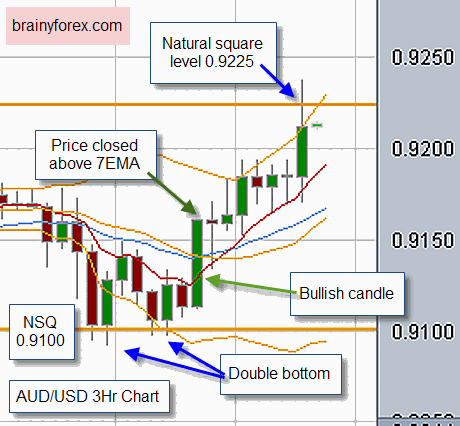 Notice a double bottom price pattern at the natural square level of 0.9100. 2.Notice a powerful bullish candlestick after the double bottom. 3.Notice how price moves above our 7 period exponential moving average. This provides us with our time component. 4.We have our day trading profit target just under or on the natural square level of 0.9225. It is also important to remember that WD Gann traded both short term and long term. He also developed many different techniques that ranged from using ones discretion in chart reading to pure mechanical methods whereby an indicator was followed for trade execution. In more modern times outstanding trading achievements have been made by traders whom have put together some of the best forex trading system. Some of those systems can be viewed here. The above system requires a lot of time to be put in watching for price patterns to develop. Most people like myself have better things to do with life than watch a computer screen all day. The solution is to develop a EA automated trading robot to trade the setup automatically. If anyone would like to join me in creating this Expert Advisor and sharing results gained through tweeking it's performance, please contact me here. Remember the multi-trillion dollar forex market has enough money circulating for everyone to share. If you are looking for a proven competition winning system that has already been fully developed I recommend choosing from this collection shown here.